Author Neil Gaiman’s criticism of Tolkien’s epic story is valid, for there are few to no major female characters in The Lord of the Rings books, and none in The Hobbit. When Peter Jackson, along with fellow screenwriters Phillipa Boyens and Fran Walsh, adapted the novels for the screen, they amplified the roles for the women that Tolkien created. Arwen is briefly mentioned and described in the books, mostly noting her beauty. “The light of stars was in her bright eyes, grey as a cloudless night; yet queenly she looked, and thought and knowledge were in her glance, as of one who has known many things that the years bring.” For the films, her role is highly expanded. Jackson and his writers made the wonderful decision of having Arwen be the one to rescue Frodo from the Nazgul. In one of the most famous sequences in the film, Arwen rides with Frodo on her horse and conjures the river to drown the Nazgul. She then heals him with the weed Kingsfoil and her Elven powers. Arwen is both a strong character with fighting skills, but she also secure and embraces her femininity, which is equally as important. A female character does not need to be a fighter to be strong. She does not need to shed or have no femininity. She is in love, but also independent. Arwen makes her own brave decision to give up her life for Aragorn, to forsake being immortal for him. Arwen is an essential part to Aragorn’s journey to becoming King. She is just as important to his quest as Aragorn is himself. Without her, Aragorn would not have the will to continue and become King. (The reluctant King storyline was added by Peter Jackson and Co., amplifying Arwen’s importance.) 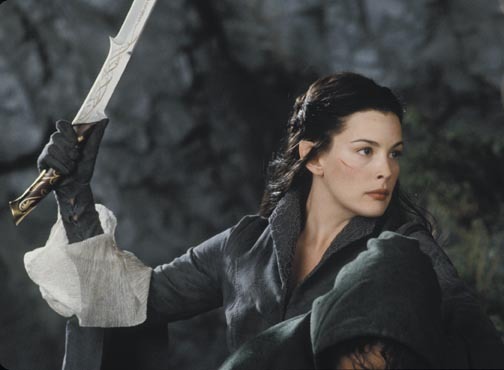 Arwen was going to have an even bigger part, fighting alongside Aragorn in the Helm’s Deep battle, but Tolkien purists thought that was too sacrilegious to Tolkien’s work and it was cut. But as you can see, Arwen’s role in the film adaptation was a huge and significant presence in the story. Eowyn is an vital character in the books, described by Tolkien as a “stern Amazon woman. Like many brave women, capable of great military gallantry at a crisis.” Eowyn becomes a big part in The Two Towers, where Aragorn meets her at Rohan. Eowyn is shown as a fighter, she has skill in sword and a desire to fight alongside the men of Rohan. Tolkien offers more insight into her psyche, when she expresses that her fears are to live as if she is in a cage, “to stay behind bars, until use and old age accept them, and all chance of great deeds is gone beyond recall or desire.” This scene is included in the film. In the The Return of the King film Éowyn plays a much larger role in the Battle of Pelennor Fields than in the book, where the only fighting mentioned is her conflict with the Witch-king and also Gothmog. (It is a surprise in the book that she is fighting, whereas in the film we are shown ahead of time that she has secretly joined them in battle) In the films, Eowyn replaces Merry as the person to sit with Théoden as he dies, where he makes her promise that she will rule Rohan in his passing. (And most likely in her brother’s passing as well, for he is next in line for the throne). 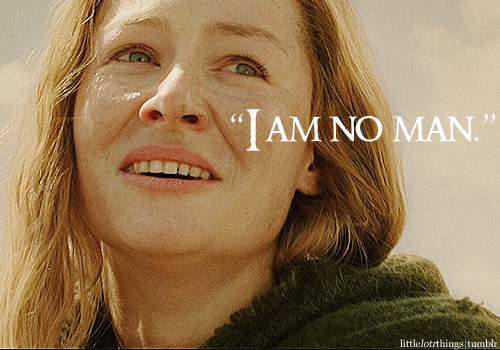 Eowyn is a prominent female character because she single-handedly defeats the powerful Witch-king. “No living man may hinder me,” He boasts in the book. (“No man can kill me” in the film.) 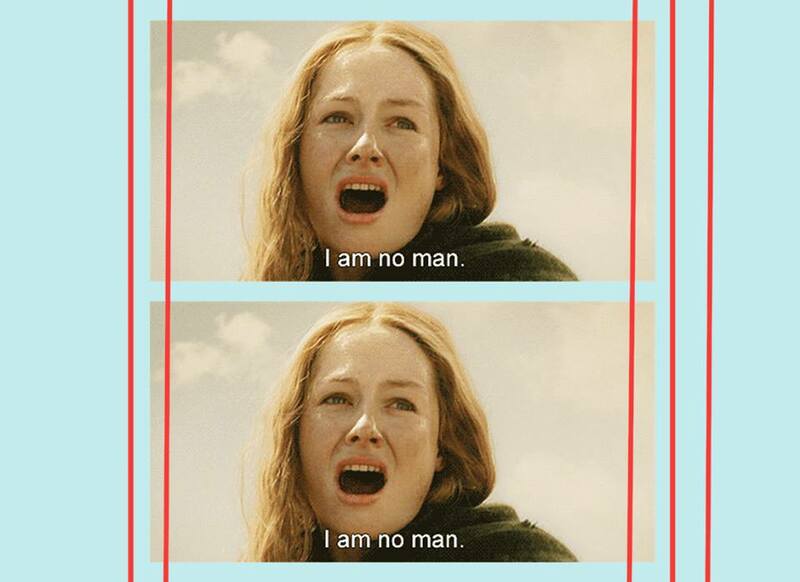 To which Eowyn replies, “But no living man am I! You look upon a woman. Éowyn I am, Éomund’s daughter. You stand between me and my lord and kin. Begone, if you be not deathless! For living or dark undead, I will smite you, if you touch him.” In the film, she proudly takes off her helmet and says, “I am no man”. And defeats him. How easily this could have been a male character, but Tolkien wisely chooses female representation for this prevailing moment. Tolkien describes Galadriel as the “greatest of elven women” and she is indeed. She is incredibly powerful, a strong, wise, and graceful ruler of the elves. She is a very important character in Middle-earth mythology, witnessing many Ages and events leading up to the War of the Ring. Galadriel is the only prominent female character in The Lord of the Rings books, and this representation is closely adapted in the films. Galadriel opens the Fellowship of the Ring’s narration, recounting the events she’s witnessed in her immortal life, and catching the audience up on the textured Middle-Earth history. The main difference is in The Hobbit films. Without her inclusion, there would be no major female characters. There are no speaking roles for women in The Hobbit books. Since The Hobbit films also combine stories from The Unfinished Tales, Galadriel is included in the subplot of the discovering of Sauron’s reentry into their world. We see Galadriel’s destruction and defeat of Sauron from Dol Guldur, his base of operations. Sauron was no match for the Elf Queen, and she defeats him. 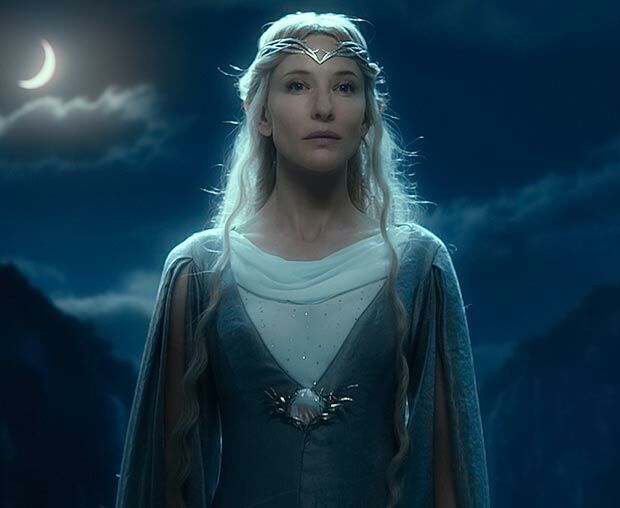 The Lord of the Rings films give Galadriel the ethereal significance as she has in the books, and The Hobbit wonderfully includes her female presence and important storylines, sorely needed for the male-centric narrative. Tauriel is not a creation of Tolkien, therefore not in The Hobbit books. Peter Jackson and his fellow screenwriters chose to include her, since the novel is completely devoid of females. Screenwriter Phillipa Boyens joked, “You start to feel the weight of 13 hairy dwarves.” Her inclusion is heavily debated between Tolkien purists, feeling that she is unnecessary to the narrative and distracts from portraying other storylines in the book. However, without Tauriel there would only be one major female character in The Hobbit films. And of course, if they hadn’t included the Dol Guldor subplot with Galadriel, there would be ZERO female characters. 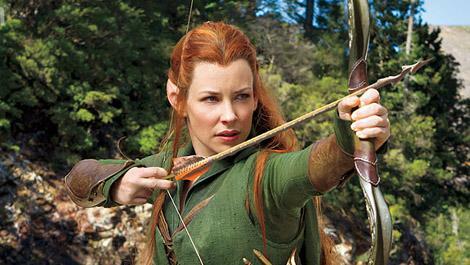 Tauriel is an elf warrior who skillfully defends the woods of Mirkwood against the growing orc and spider invasions. She is introduced in The Desolation of Smaug. Tauriel is given a side plot where she falls in love with the dwarf, Kili. They have one major scene together, where Kili talks of his childhood. She eventually makes her way to Laketown, where she heals a wounded Kili with Kingsfoil and her elvish spells, homage to Arwen’s scene with Frodo. Some may feel a useless love story, which further demeans her in the third film. In The Battle of the Five Armies, she does fight in the battle, but is quickly reduced to a wounded damsel-in-distress as an excuse for Legolas to save her. Many feel that it was gregarious to include a female character but only have her serve as a love story. Arguably, Kili’s relationship with his brother should have been relationship enough. Yes, Tauriel could have been executed in a better way, but Arwen and Eowyn were also fighters with love stories of their own. I don’t think Tauriel is worse off because she falls in love. The plotline may be rushed and forced in, but I still commend Jackson and Co. for choosing to add another female character. I don’t believe Tolkien’s work is inherently sexist. While it is readily apparent that Tolkien’s world does not contain many women in the story, those that are a part of the story are quite powerful. Tolkien’s works are heavily inspired by myths and his experiences in warfare, places that unfortunately do not have a place for many women. But thanks to Peter Jackson’s choices in the film adaptations, women were able to get a better representation in Middle-Earth.